Summary: Learn how to fit a kitchen worktop, cut a kitchen worktop and install a kitchen worktop. Worktops vary massively in shape, size, material and price. When selecting a worktop, make sure you have thought about the best suited material for you based on how much you use your kitchen worktops. The instructions below are for basic laminated worktops which are usually made from MDF; however the instructions will apply for worktops of a similar material. Granite, marble and hardwood worktops are more expensive and difficult to install. Start by positioning the worktop you will be using onto the base units with the back edge up against the wall. If you choose to have an overhang at the front, make sure it is even all the way along. The overhang should be about 40mm. If it is more than this, measure how much excess you’ve got and cut it off the back end of the worktop using a jigsaw. 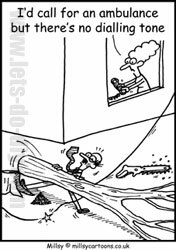 When using a power saw use protective gloves and goggles. Now you need to cut the worktop to the shape of the wall behind the unit. You can do this using a method called scribing. Reposition the worktop so it has an even overhang on the front, then measure the biggest gap between the back end of the worktop and the wall. Cut a block of wood to this size. Pressing the block up against the wall, run the block and a pencil down the length of the wall so a line is drawn where the worktop needs to be cut. 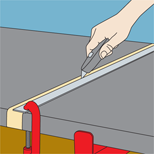 Clamp the worktop to a workbench and cut neatly along the line using a jigsaw. You can sand or plane the edge smooth afterwards. When cutting the worktop to the length you want, you will need to measure and mark a line where it will be cut. Then cover the line with masking tape. Clamp a straightedge along the cutting line to keep the cut as neat as possible. Use a fine tooth blade to prevent damage to the veneer and support the off-cut section so it does not suddenly snap off whilst cutting. Take off the masking tape and smooth the edge with a sharp plane. Conceal the rough edges using some matching trim, an end cap or a metal finishing plate. You will need to repeat the process if your worktop runs around a corner. Scribe the adjacent length that backs up against the wall and cut it so the worktop fits snug against the back wall. If your worktops are mitre cut you will need to line up their angled edges first, making sure the overhang is even on both sides and then scribe the second worktop so that it lines up with the wall. 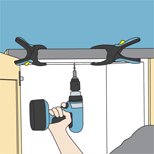 Now you are ready to install the worktop by fixing it to the units. Do this by positioning the worktop onto the units and marking where the screw holes will be on the underside of the worktop. Drill pilot holes using a drill bit smaller than that of the screws. If you are installing two worktops, line up the second one and mark where the screw holes will be. Then drill the pilot holes. When joining two worktops together, different methods are used depending on the type of join. Straight cut worktops require the use of a joining strip which needs to be screwed to one of the worktops and then secured from underneath. Mitred edge worktops require adhesive and need to be screwed together from underneath. Fix the worktop or worktops to the units by screwing 18mm screws from underneath. Finally use a silicone sealant to seal the joins. You may need to scribe the worktop to fit it snug to the back wall. 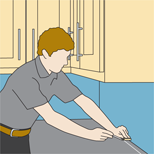 When cutting the worktop use a straightedge to help you cut in a perfectly straight line. 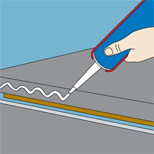 When joining two straight worktops together use a joining strip and secure it in place from underneath. Once you have marked and drilled the pilot holes, fix the worktop in place with 18mm long screws.